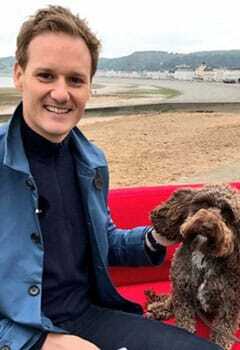 Dan Walker is best known for hosting shows including Football Focus and BBC Breakfast who began his career in broadcasting on radio station, Hallam FM . Dan worked at Manchester’s Key 103 radio station spending four years as a sports reporter. Dan covered some of football’s biggest games, including Manchester United’s Champions League fixtures. He then moved into the world of television with a six-month stint on Granada Television , again focusing on sport. In 2005 he was named the ‘Regional Sports Presenter of the Year’ at the Royal Television Society Sports Awards . In 2006 Dan joined the BBC covering a wide range of sports. In 2010 he travelled to South Africa for the World Cup where he filmed several packages for both their TV and online platforms. Since then he has covered every major football tournament for the network as well as, the Olympics. 1999 - Graduates from Sheffield University with a MA degree in Journalism Studies. 1999 - Joins Manchester's Key 103 Radio station. 2005 - Named Regional Sports Presenter of the Year. 2006 - Joins BBC Sport . 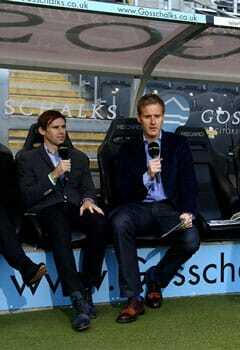 2009 - Takes over as host of Football Focus . 2010 - Covers the football World Cup in South Africa. 2016 - Joins BBC Breakfast as a presenter. 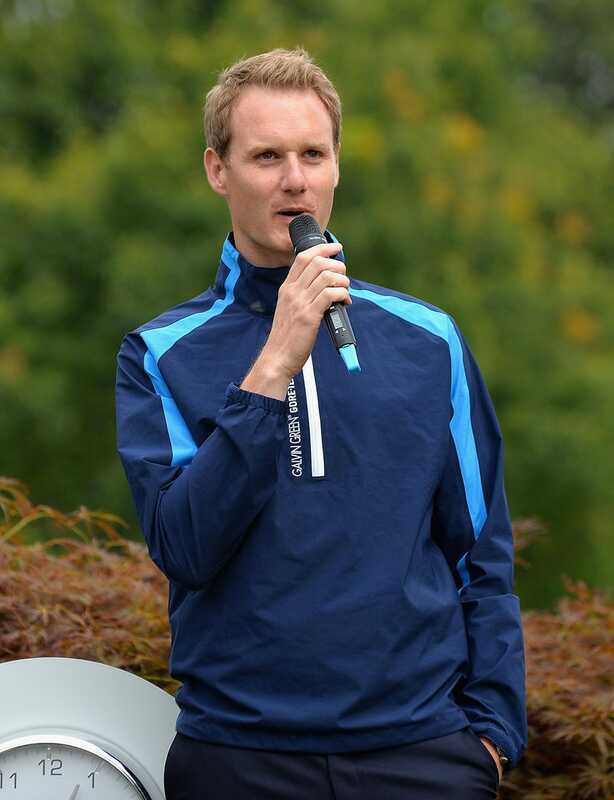 From an early age, Dan Walker always had ambitions to be a sports journalist, and upon completing a history degree in 1998, he decided to do a Masters in Journalism. Graduating from the University of Sheffield in 1999, Dan began his broadcasting career in the Yorkshire city at radio station, Hallam FM . From here he progressed to Manchester’s Key 103 radio station where he specialised in sport and quickly became one of the station’s most popular presenters specialising in sport. Regularly covering Manchester United’s biggest domestic and European matches, Dan’s vast knowledge and passion for sport shone through, and it wasn’t long until he was scouted by television stations. Following a six-month stint at Granada Television , he joined BBC regional news show North West Tonight. It was here that he really made a name for himself in the industry, winning numerous awards including the 2005 ‘Regional Sports Presenter of the Year’ award. Despite scooping the prize Dan was actually unable to attend the ceremony due to reporting on Liverpool’s Champions League victory in Istanbul. A year later he began making an impact on a national level after joining BBC Sport . Initially, Dan worked on their coverage of a range of sports including Wimbledon, Six Nations and The Open . 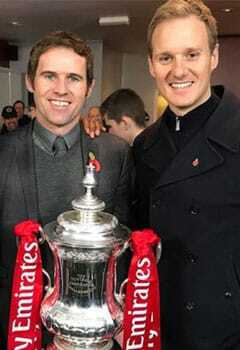 However, football was his true passion and in 2009 he jumped at the chance to hose the long-running Saturday afternoon show Football Focus. The show has been a British institution since it first aired in 1974. Previewing the weekend’s footballing action, Dan proved an instant hit with audiences and remains its host. As well as Football Focus, Dan has also contributed to a range of the BBC ’s other footballing based programming. He has stood in for main host Gary Lineker OBE several times on the iconic Match of the Day . In 2010 Dan received his first taste of live football presenting when he joined the BBC ’s coverage for the World Cup in South Africa. He spent the tournament travelling around some of the country’s most famous landmarks meeting football fans and previewing the games. His role was widely praised, and he has contributed to every major football tournament since then. He has also joined the BBC ’s coverage of the Olympic Games , most recently with a regular evening slot at the 2016 Games in Rio de Janeiro. Away from sport, in 2016 it was announced that Dan would be replacing veteran broadcaster Bill Turnbull on BBC Breakfast . Hosting the show alongside Louise Minchin from Monday to Wednesday he has demonstrated his ability to appeal to all audiences and is a regular in people’s living rooms every morning on the show. As one of the country’s most respected and popular television presenters, Dan Walker has a huge reach on social media and regularly uses platforms such as Twitter and Instagram to engage with his followers. In associating your brand with Dan you can guarantee to be exposed to a wide range of people. A keen golfer, Dan regularly attends golf events and charity days, which can also be the perfect place to promote a brand to new audiences.